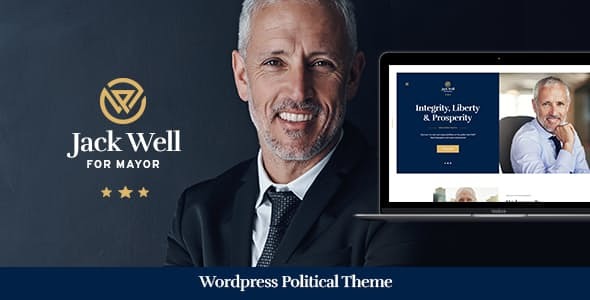 Jack Well – powerful, responsive & trendy Political WordPress theme. It is a splendid solution for politician, modern political leader, activist, election campaign, contemporary political. Also it works for social movements, political party or individual candidate website, political reviews, as well as any non-profit organization websites. It covers important topics: human rights, charity, volunteers, president, parliament, government, fundraising, policy, events conference, voter’s testimonials, politics, political tasks, missions and priorities. Also it is great for: political blog, social blog, political news and political magazine. The Theme is based on the powerful ThemeREX framework and made with WPBakery Page Builder (aka Visual Composer, which we think is better than Elementor) and has 2 homepage layout options (plus the boxed one as the third). It is the best solution for political and social figures. It uses a set of shortcodes and widgets, it is SEO ready, and compatible with Events Calendar Plugin, to inform your voters about upcoming meetings, and Give – Donation plugin to raise funds for your campaigns.